If you recall, I had finished the building the day before I left for the Healdsburg Guitar Festival (which was Thursday, August 16th) --- the festival lasted until August 19th -- I stayed the whole time -- decided to splurge a bit, and stayed in a step up from my usual Motel 6 --- a Holiday Inn Express!!! Very nice --- Internet DSL access, a fridge, microwave, coffeemaker, ironing board, blowdryer, nice linens, a little balcony --- even room service, if I wanted it (but I didn't -- too expensive!). Very nice breakfast bar, too. It made the stay up there very enjoyable. Saw LOTS of amazing guitars, lots of great mini-concerts & seminars, a great concert with a fantastic guitarist I'd never heard of before (Michael Chapdelaine), met up again with lots of guitarmaking friends --- get this, even got interviewed on film for some cable/Internet access film-making crew, who are trying to focus on community stories (have no idea if/when it will ever air anywhere, though). What I promised myself, though, was that I would NOT TOUCH THE GUITAR after I got back from Santa Rosa (where the "Healdsburg" Guitar Festival is held), because I needed to start doing some schoolwork planning. I was pretty good about that. 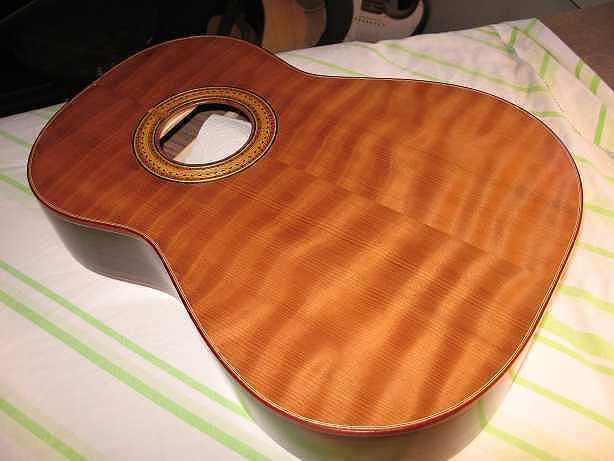 I did, towards the end of the week, however, break down and start sanding the guitar, in preparation for finishing it. With school, it would just be too hard to do it in the regular way (spraying a finish), so I experimented and decided to do a "Tru-oil" finish --- it's actually gunstock finish --- an oil finish that you just wipe on with a cloth (after a seal coat of shellac, so the oil doesn't actually soak into the wood), then wipe immediately off, so there's barely a thin coat of finish left on the surface. Because it's oil, you can only put on one coat per day (it takes a long time to dry) --- and because it's so thin, you have to put on LOTS of coats (maybe 8-10 or more). But it's so easy to apply, it's something I could easily handle once school started. So that's what I did from August 23rd to September 3rd. I ended up putting on about 12 coats of the Tru-Oil. Then the hardest part came....the waiting. 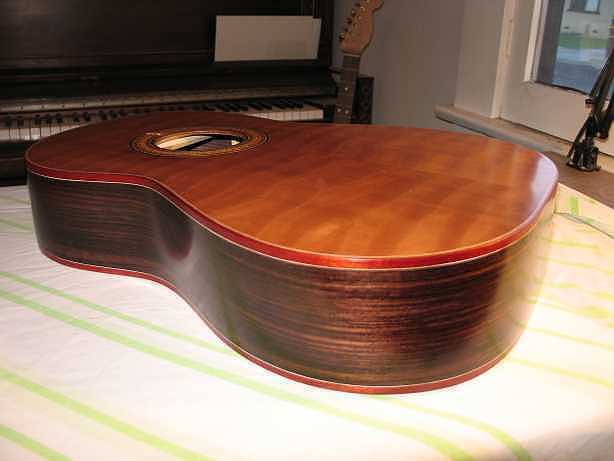 I told myself I would wait a full three weeks after the last coat was applied, before I touched the guitar again. I kept my promise (it wasn't hard, though, as school, which had started on August 28th, kept me really busy). The three weeks' wait time ended on September 24th, this past week. So...this weekend I did the polishing. All I did was use (dry) my Micromesh sanding cloths 6000, then 8000, then 12000 grits. Then I used Meguiar's #9, then #7, and finally #10. I loved how easy this application process was! Here are a couple of photos of the body as I was applying the Tru-Oil.